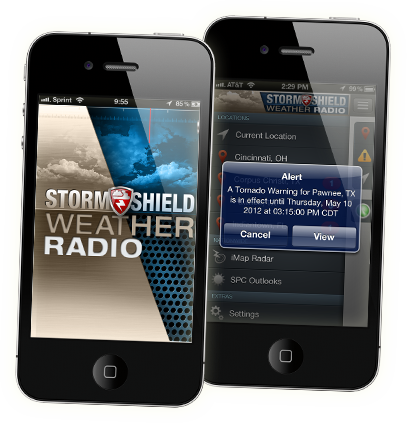 TUAW reviews our Storm Shield weather radio app. Have you gotten it yet? This entry was posted in In the news on July 5, 2012 by admin. The Knoxville News Sentinel’s parent company, E.W. Scripps, has launched a NOAA Emergency Weather Radio for the iPhone. It works, well, much like a weather radio, but is less expensive ($4.99) and easy to customize. Through the app, you will receive critical alerts via voice and push notification on major weather events. Even when it’s not open, the app will “wake up” your iPhone with alerts wherever you are. Precise Alerts: Storm Shield provides more accurate alerts than many alerting services. Most services will alert you to severe weather if you are in a county only partially covered by a watch or warning, even if you are not actually directly within the watch/warning. Storm Shield alerts you only if the phone device or saved locations fall inside a watch/warning box. You can preselect and customize any or all of dozens of possible official National Weather Service watch or warning types. Follow Me: The app will alert you if you are in an area when a relevant watch or warning is issued, no matter where you are in the United States. Friends and Family: You can save up to five locations in addition to your current position. This will help you alert your friends and family in other locations of weather hazards. Battery Management: You can control how much accuracy you want the application to use for your location, which will affect battery life. Use iOS Location Services for maximum location accuracy with background tracking. Disable background tracking to conserve battery life and use GPS only when the app is open. Audio: Storm Shield provides audio alerts beeps followed by a brief description of the alert type. The audio could wake you in the middle of the night, or give you information you need when you can’t stop to look at the phone. You can also listen to the alerts and forecasts for your area at any time. Get more info or download the app by going the app’s website. This entry was posted in In the news on May 27, 2012 by admin. The Knoxville News Sentinel and The Memphis Commercial Appeal have launched PolitiFact Tennessee with PolitiFact.com. This entry was posted in In the news on January 15, 2012 by admin. team and recruiting information on the Internet. site of the Knoxville News Sentinel. one of the fastest growing sites in the 247Sports network. still use when they talk about the site. innovative technologies of the 247Sports network,” Birmingham said. you can try the site for the rest of the year free with no obligation. Go to www.govols247.com today! company that consists of market-leading college team and affinity sites. 247Sports, is a former Rivals.com executive and football recruiting pioneer. space before selling the company to Yahoo! in 2007 for $98 million. This entry was posted in In the news on November 1, 2011 by admin. In the Washington Post blog The Fix’s annual list of best state political blogs, Knoxville is heavily represented. The News Sentinel’s Tom Humphrey made the list for Humphrey on the Hill (OK, he’s based in Nashville, but works for a Knoxville newspaper). Knoxville State Sen. Stacey Campbell’s Camp4U blog is on the list. KnoxViews, the long-running progressive, community-driven citizen media site, founded by Randy Neal also was picked as among the best. The final Tennessee state political blog on the list is PostPolitics in Nashville (there had to be one without a Knoxville tie). Stateside Associates of Arlington, Va., which bills itself as the largest largest state and local government affairs firm, also has included Humphrey on the Hill among its best state politics blogs. 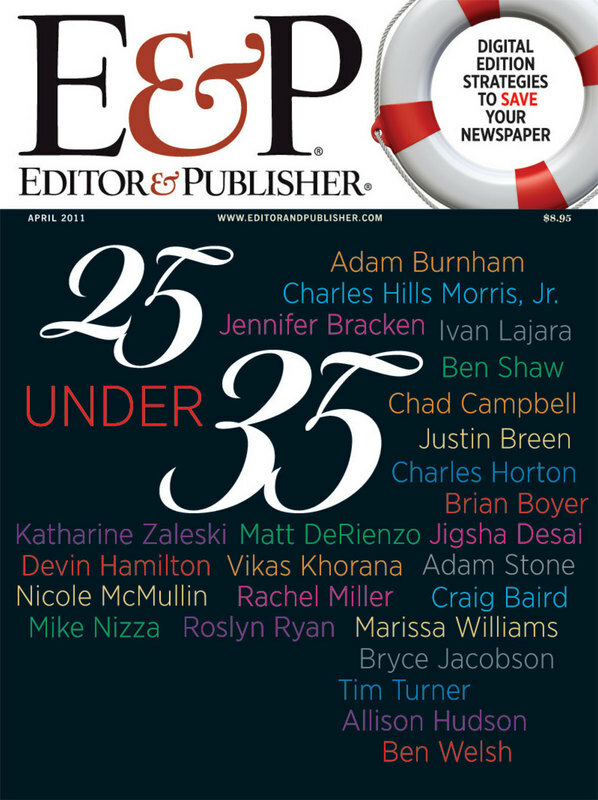 The Nashville Post’s PostPolitics made that list, too. This entry was posted in In the news on September 8, 2011 by admin. Knoxville News Sentinel Visuals Editor Jigsha Desai is documenting Bonnaroo in video in her maiden visit to the festival in Manchester. This is a playlist of the videos she has posted. Follow her tweets on Bonnaroonews. This entry was posted in In the news on June 11, 2011 by admin. 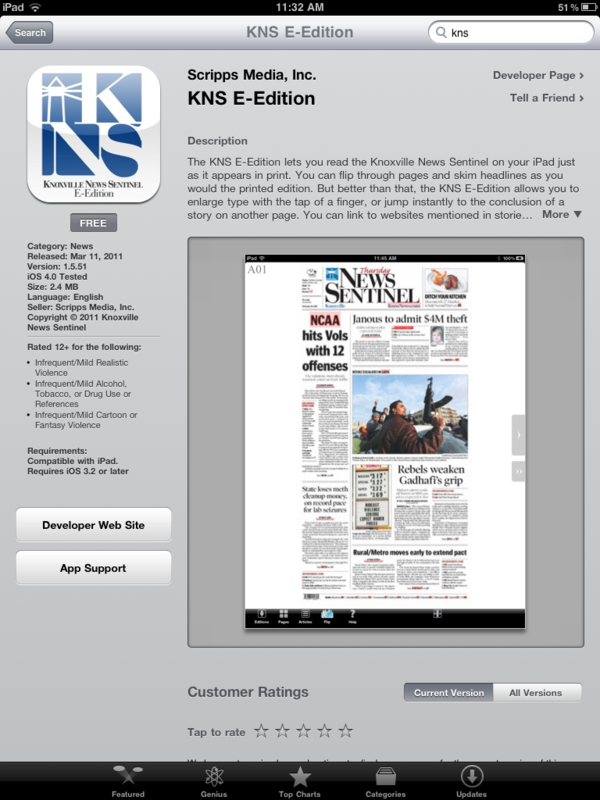 Above is a screen shot of the information page for the iPad app for the Knoxville News Sentinel. Give it a try. The looks like a replica of the printed newspaper, but also can contain videos and photo galleries and clickable links. This entry was posted in In the news on April 29, 2011 by admin. They are young enough to have giant Homer Simpson cardboard cutouts in their cubicles, energetic enough to work long hours without Red Bull, and savvy enough to start not one but three newspapers in the midst of a historic downturn. Theirs is a different journalism than their older counterparts. They find it hard to believe that before Google people actually had to make calls or go to the library for information, or that media kits were hardbound and sent by snail mail. Although they’ve practically grown up with the Internet and a cell phone at their fingertips, they’re smart enough to know that if they don’t understand a new piece of technology, they can always ask someone five years younger than them to figure it out. Change is something so familiar, they simply roll with it. This entry was posted in In the news on April 6, 2011 by admin. This entry was posted in In the news on March 17, 2011 by admin.